Karber's Blog: Feline Playful Blog Hop! Hi everyone! So happy to be part of the Feline Playful Blog Hop! For my card I used Alice Leslie digital stamp, you can find it here. For the second card I used Dorothy from the Wizard of Oz digi pack, you can find it here. The secret letter we are sharing here is "F". Be sure to write comments on all the participants blogs and get the chance to win more prizes. Gorgeous card - such a sweet image. Thanks for all your hard work bringing us the daily challenges and winners etc. Your card makes me so happy. i loe the autumn. Thanks for your works and the blog hop. Love the hop. And your cute card. oh the image is just adorable love how you have colored it . What a great card - such a cute image and a fab hop ! Happy International Day of Gratitude thanks to all the ladies at feline playful for all their hard work - it's one of my daily stops ! What a gorgeous Thanksgiving card, lovely colours. What a pretty card! I,m following you know and thanks for the wonderful hop. Fun cards. I'm a new follower. You cards are just adorable and that rainbow just rocks! And thanks to You guys for your work at Feline! Great card and fun blog hop! Thanks to Feline Playful for all you do! Cute projects! Great blog hop with fun prizes. Cute image! Great blog - off hopping! Two very adorable cards!!!! Love the use of the twine as a rainbow on your second one!! Adorable cards! Love those images. I use Feline Playful every day to help me decide which challenges I can combine without doing a dis-service to the theme on any one of them. Thanks for all the hard work you do! How cute are those cards!! Thank you for the chance to win! thanks for hosting this fun event....I love blob hops, I meet so many neat people this way!!! Love your Oz card. I think I will have to go by & get this. wow that's a very cute card! loved the rainbow twines and the cute image! loved the blog hop too! Oh my goodness, how cute is that image! Darling card! Both are great! Love how you used the twine on that second card. Thankyou for being part of the wonderful team that makes the art of challenge entering so easy. Happy crafting,Julie. Wow, love both your cards, but I love how you did the rainbow. Great idea. Great cards. I love Feline Playful. Super cute card! Thank you for joining in this fabulous blog hop! Pretty cards. I love the rainbow on the second one. Oh I so love that adorable rainbow made with the bakers twine - super cute idea and both are adorable cards! Love them! Thanks so much for being a part of Feline Playful and making my life so much easier. Really cute cards....love the rainbow on the second card. and just wanted to say a HUGE thank you for all the hard work you put into maintaining the FP blog. Very cute images. Love anything Oz! Cute cards! Thanks for a great blog hop! Adorable cards! The images are so cute and I love how you used the twine! Hey Berenice, these cards are so sweet, great job! The images are so cute: lovely card! Great cards and I looove how you made the rainbow on the second one! Thanks for helping Feline Playful such a fantastic resource for the rest of us! Gorgeous cards. Loving this blog hop. SO many new blogs to visit. Cute images and I love that candy stripe rainbow. :-) TFS! Cute cards! I am so loving that twine rainbow! Super awesome! Thanks for hosting this blog hop and your fabulous images! What a "F" abulous idea! All I know is that we can't thank all of you team members enough! You do an amazing job keeping all of us informed and on track. Thanks ever so much, awesome card! Cute image! Love the twine rainbow! Hi Berenice.... thanks for sharing your fabulous creations on the Feline Playful bloghop... what fun! What a very creative pair of cards! I love how bright and colorful they are! Too fun!! Thanks for the hop! What a stroke of genius to use twine to make the rainbow. I would never have thought of that! 2 fabby cards, cute images!! What a great pair of cards!!! Really cute card. This will be one fun hop - can't wait to get hopping and thank you for all the work you all do for us. Really cute cards. So far this is a fun hop. Lots of fun in the hop. Love, love, love the twine rainbow! oh wow such wonderful cards. I love them. Both cards are quite cute! I especially love the twine rainbow! So creative! Great cards! I love your twine rainbow! Cute cards with some great images from Karber. Great cards and lots of lovely stuff on your blog - thanks for being part of this opportunity. your cards are cute and i love that shiny butterfly! hopping along now.. Your cards are so sweet! Love those images. Thanks for all you do! Such an adorable card!! Thanx for sharing..
Hi Berenice, I would be lost without you and the girls over at Feline Playful, thanks for all your hard work daily. Adorable thank you cards hon. Berenice - love your creation and super job over at Feline Playful! What sweet images!! Your cards a super cute. Thanks for a fun hop!! Cute cards and great images. Thanks for helping to run Feline Playful! What a cute cards you made! I want to thank you personally for the fantastic work you all do on the Feline playful blog! I love to use it almost every day! I hope you will do this fantastic work for so much longer! Pretty cards and love the image used. I like how you used those twines for a rainbow. It did brought cheer to my very tiring day. Here's hoping to get lucky! Your cards are adorable! Thanks so much for all you do at Feline Playful! Lovely cards!Love the bright colors! Thank you so much for the work you do for us over at Feline Playful! Congrats and have a great day! I love the "rainbow idea"
What a fun idea to use the twine as a rainbow! Gorgeous cards :) I'm enjoying the Hop. Gorgeous cards...wonderful images! Happy to be a new follower via the Feline Hop!!! Lovely cards, so sweet images and colours! Such cute cards! I especially love the twine rainbow! Thank you so much for all your hard work for us updating challenges etc on the website! Your cards are adorable!!! 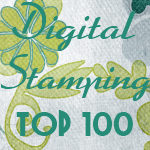 Perfect embellishments and love the sweet digi stamps :) Thanks so much for everything you do on this fantastic site! I love little girls, and what a great rainbow to boot! What cute card! The twine rainbow is a great idea! Thanks for everything you do at Feline Playful! It is truly appreciated! MWAH! i absolutely LOVE how you used the twine! fab-u-lous! These cards are so darn cute. Love both images and the twine to make rainbows. Thank you for all that you do to make Feline an AMAZING blog. If it weren't for you all...I'd be completely lost. These are both adorable! That twine rainbow is a great idea! Thanks for the fun hop! What a fab idea the way you've used baker's twine to make the rainbow - super clever! Your cards are lovely! I love that rainbow! So cute! !